Previously the title of this post was: “How to Track TSTV Premium Channels for Free on FTA Decoders” but, now changed to, How to Track New TSTV Channels and New FTA Frequencies released!. So now TSTV have upgraded their position to a newer one, that is on the NIGCOMSAT satellite side. Thus rendering the previous information on this post obsolete. In this new post, I would strike out the obsolete part and update you guys with the new information and tracking frequencies. If you already know what TSTV is, don’t waste time to read the remaining subsequent lines. Simply scroll down to the bottom of the page to get the updated frequencies you can use for tracking or visit this page, NIGCOMSAT, to nail NIGCOMSAT channels alongside TSTV channels too, since, they are now at same position. If you already have NIGCOMSAT channels already on your decoder, simply blindscan your decoder to nail new TSTV channels that now resides their Ok!. TSTV, is no new news for any one following up with the FTA and Pay TV satellite stuffs in Nigeria. Since, the announcement of TSTV Nigeria, the likes of popular pay tv’s like, DSTV and co. have been perturbed as TSTV have come to rival all what they’have got, providing premium channels for lesser price. In this article, we would present to you, step by step of how you can quickly track and begin enjoying TSTV channels for free. 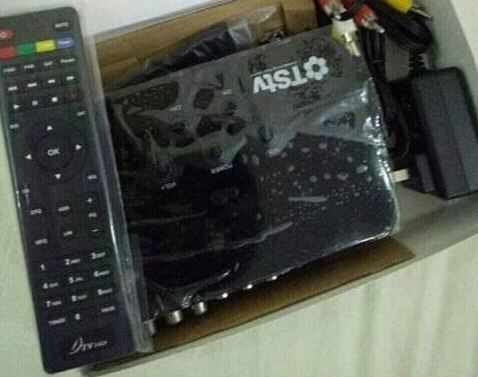 Now, TSTV is now on air and the good news is that, you can track and get the CHANNELS EVEN IN YOUR NORMAL FTA DECODERS, like the likes of STRONG, QSAT, HDbox, and all other TV box from China. Many folks are already enjoying TSTV channels on FTA receivers for free. For now you can follow the procedures on tracking that will given in this post to enjoy the pay TV channels, eventually the channels will become encrypted, but, for now you can watch them for free using FTA decoders. 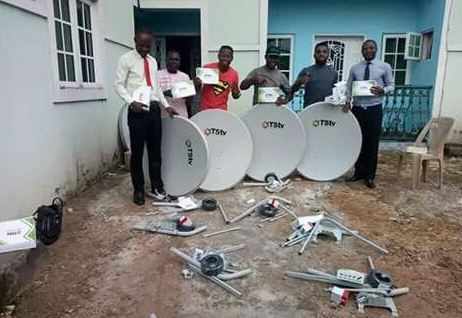 TSTV are yet to get their decoders fully into circulation, when they do they will encrypt the channels, and one have to revert to paying and possibly obtaining their decoders. But, before, TSTV fully get everything right with setting up and testing their services within the country, all we can do, for now, is to do what we know best how to do; ENJOY EM’ THE CHANNELS FOR FREE. Well, before the channels go encrypt, may take up to a month or two. 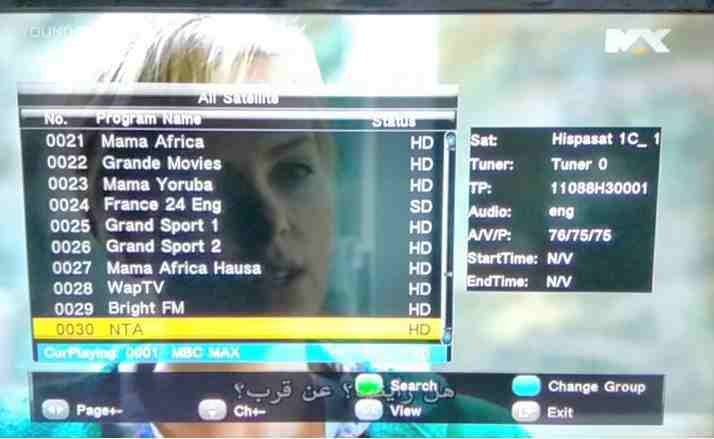 TSTV currently have 37 channels that you can watch on your FTA decoder, also providing live football channels like, BEIN; whose commentary is in ARABIC. You have noticed, I have strike out some old post below: TSTV channels are now located in NIGCOMSAT position at 42.5E. To get TSTV channels first nail NIGCOMSAT channels using the tutorial given in this link, NIGCOMSAT, then input these frequencies below or blindscan to get the remaining TSTV channels. Over the years TSTV have been proven to be unstable in particular satellite position. They have been switching from one satellite to the other. So therefore, bookmark this page in your browser. As this page will be constantly updated with the latest TSTV frequencies and position. Blindscan your decoder to get the rest. Trackable FTA Satellites TV Channels East to West Africa. TSTV is located in the Position of ABS 3A @3° West Bird Satellite. The frequency of tracking is 11052 while the symbol rate is 30000. And polarity is Horizontal (H). And minimum dish size should be 60cm up wards. If you have 1.5m dish, you are good to go. To track the 11052(H) frequency, you can use any FTA decoder on your current setup like, STRONG, QSAT etc. Dish Size: 60cm, 90cm(DSTV type dish) and above. Recommended Dish Size: 90cm(DSTV like) and above. So far Tstv Africa maintains their beaming position on ABS 3A 3ºW. The tracking frequencies for TSTV are either you use, 11167 H 30000 or you use, 11088 H 30000. Also, it should be noted that Bein sports HD 2 appears as GRAND SPORT 1 while bein sports HD 4 takes on the name NOW GRAND SPORT 2. While other channels appears just fine. 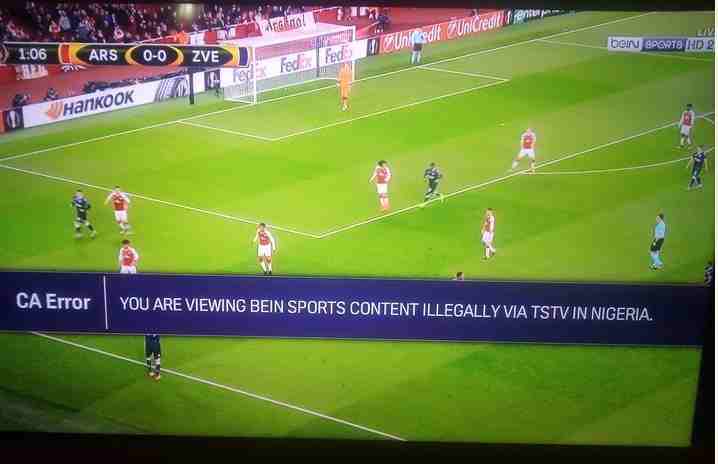 On Bein sports, you can watch various football matches, like champions league, Premiere League, Italian Seria A. TSTV is currently facing a copyright strike: See image below, for proper understanding; I must say: “Sad, Indeed! But, that not withstanding, doesn’t stop you from enjoying other channels for free at the moment. Many people are optimistic they resolve whatever glitches the have with Bein, hope they do so on time. As so many Nigerians have put fate on them, to wipe out the likes of DSTV, from perpetual MONOPOLY in the Pay TV niche. On your Strong Decoder, QSAT or any other Chinese FTA decoder, input 11052 H 30000, on ABS@3.0W, to nail this bird, while standing near your dish at the front, raise your dish up around Nilesat @7W, MBC position. Once you hit green, you scan it and you should get the TSTV channels. You can also try other available frequencies to see if you can also get more channels like: 11168(H) 30000. 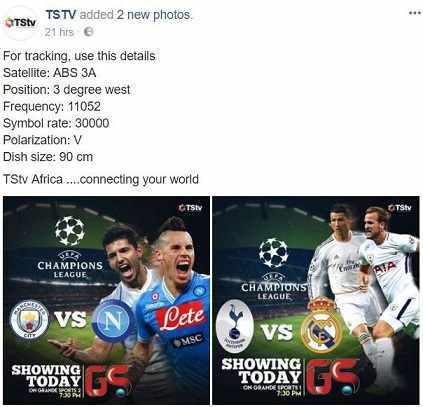 The method of tracking above doesn’t only applies to FTA decoders, but, also on TSTV decoder. 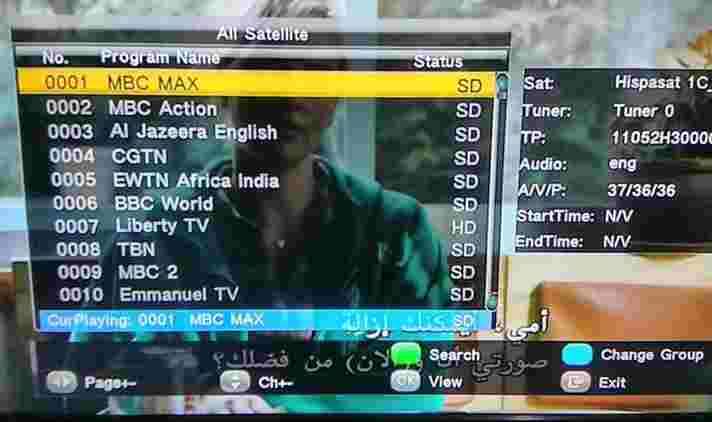 However, when you use, FTA decoder like, Strong or Qsat, you may not get all of the channels correct name listings. Note: POLARIZATION, Horizontal (H) or Vertical(V) depends on your LNB orientation. So you can switch with both at different instant when tracking. Above are all the frequencies you can use to nail TSTV AFRICA, on your FTA(Strong, QSAT) or TSTV Decoder using at least a 60cm dish and above. Happy tracking! Do leave a feed back of how your tracking went. Enjoy!, TSTV for Free while it last, also pray they resolve, their copyright strike stuff with Bein, sure most people want the monopoly of DSTV to come to an end!. Yes!, an end. Before, that happens, get a dish, a decoder and track TSTV!. My blind scan refuse to bring out any tstv channels. Though other Nicomgmat stations seems to show except for tstv freq. TSTV recently went offline. When they do come back. Will update here. cheers! Pls what is the new frequency for TSTV? Hi, i have been enjoying TSTV since beggining,but have the sports channels like bein sport and other,except the fox 1,2 and grand sports channels,also Rewendu,discovery and others,please what don i do to start enjoying those channels mentioned,Thanks. I dont have the sports channels,like bein sports and others,except the Fox 1,2 and Grand sports channels,also dont have Rewendu,discovery and others,please what can i do to start enjoying those channels mentioned,Thanks.